The first visit has 3 steps which are combined but can be separated on request. 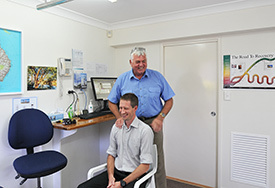 The chiropractic assistant will organise a suitable time for your initial consultation with one of our chiropractors. Depending on your level of knowledge on chiropractic, you can request a female or male practitioner. If you have a favourite technique then we may be able to place you with a practitioner that specialises in that. If you prefer manual to instrument adjusting then that can be accommodated. You will be asked to fill out some forms with personal details, past health history and presenting problems. Once these are completed, you will be moved into a private room. Your chiropractor will introduce themselves and ask some questions to determine that you are in the right place. You may ask your own questions and discuss any concerns that you may have about your visit. Chiropractic can always be of benefit to your health, but some health complaints require priority which may be addressed better by our medical colleagues. If you have a problem that requires another type of professional, we will refer you to them. If we cannot help or you decide not to proceed, there is no charge at all. We do reserve the right to keep your information for our records. If you proceed, the normal fees apply from here on. If you would like a complimentary consultation it is best to make the chiropractic assistant aware at the time of booking to avoid misunderstandings. The examination depends on many factors and it may involve you having to put on a gown to allow proper examination of an area. Your modesty will be of the utmost importance throughout the examination. Once the examination is completed, your chiropractor will decide whether we can be of assistance and will take your case on. It is here that you may be referred for radiographic examination for further assessment. We refer to medical radiologist for our films as they are covered by Medicare. This has a slight drawback with having to go out for X-rays, but this disadvantage is negated by the positives of having a specialist confirm the x-ray findings. These x-rays are sent through to the practice via the internet and the 2nd appointment is scheduled usually on the next day. With patients in extreme pain these procedures are impossible so if you are in extreme pain please state that when you ring and we will change our procedures to ensure that you can get as much relief as possible, as fast as possible. Progress visits will monitor how you’re responding to treatment. It’s impossible to predict how you will respond to chiropractic care, as everyone is different. We’ll have a better idea after a dozen visits or so. You’ll invite a relapse of your original problem if you discontinue your care once you feel better. It’s at this stage that we can make a more accurate prediction about what it will take to complete your recovery and what will be needed to help you stay well.